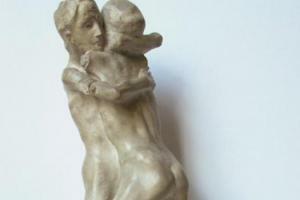 The motif of standing, naked youths with straddled legs is seen for the first time in Men Fighting, one of Minne's earliest moulded sculptures. The artist takes up the theme again in the Small Injured Figure I and II, the Large Injured Figure, the Man with a Waterskin and Solidarity. 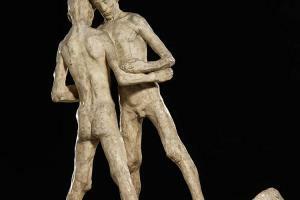 From Men Fighting, the Museum of Fine Arts Ghent possesses the only known copy in plaster. There also exists a wooden copy that is found in the Karl Ernst Osthaus Museum in Hagen. 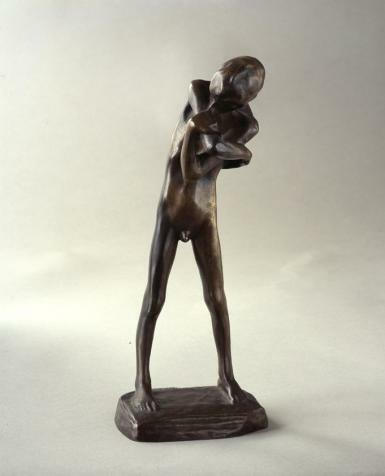 The Small Injured Figure is the first example in Minne's oeuvre of a stand-alone naked youth with straddled legs. There are two different types of the Small Injured Figure that differ only slightly from each other and that both are executed in various materials: plaster, marble and bronze. The first version dates from 1889, the second from 1898. The complex position of the arms suggests a great physical and psychological tension. The wound that the youth touches on his upper arm is like an excuse to wrap himself up within himself, to hide himself. We recognise herein a form of narcissism, but also a necessity to turn one's self away from the outside world, a typical attitude that comes back in other work by Minne and finds a high point in the Fountain with Kneeling Youths. The Man with a Waterskin from 1897 is one of the few sculptures for which a fairly large series of drawn studies are known. Herein we see how Minne departs from a baptism tableau, and gradually gives way to a secular concept. 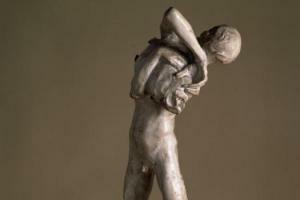 The sculpture shows an emaciated young man who tilts a leather waterskin. While contemporaries, such as Auguste Rodin and Constantin Meunier, usually place the emphasis on the rendering of a harmonious power of the body, Minne's sculpture radiates instead an elementary and inner strength. Noteworthy is the energetic tension that emanates from the figure in his search for balance. The intricate position of the arms around the waterskin recalls the Small Injured Figure. There are known copies of the Man with a Waterskin in plaster (the copy of the Museum of Fine Arts Ghent, among others), in bronze and in marble. 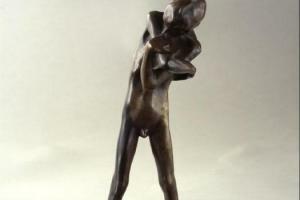 In the Project for the Volders Monument, also called Solidarity, Minne takes up again the motif of two figures clasping each other. For this sculpture group there also exist numerous drawn studies in the sketchbook from ca. 1894-1898. The sketches give us an image of the manner in which Minne searches for different solutions for the form of the ship and for the position of the head and arms in a often aggressive drawing style, while the parallel places, straddled legs of the youths and the concept of the ship were present at the beginning in his studies. Of the original design in plaster different examples in bronze and marble are executed.